How to Maximize SEO on Blogger - Below is a complete tutorial on how to maximize SEO in blogger (blogger.com) for your blog more loved by Google. If your blog is loved Google then your blog will be given a good ranking, and if the ranking is good then automatically visitors blog buddy will increase. Who does not want to blog visitors increased? All bloggers must want, especially for those who are making money from blogs. As with any blogging service in general, bloggers also provide an RSS feed feature to facilitate our blog readers to subscribe to articles we publish. This feature is actually very good, especially to capture the reader. But on the other hand RSS feeds can also be bad for our blog SEO. How come? As we know, in the present day a lot of lazy bloggers who want all instantaneous who often steal the contents of other people's blogs. Well, this RSS Feed lately is often used by content thieves as a way to retrieve content that is on our blog without having to bother CTRL + C and CTRL + V.
If our blog becomes a victim of content theft through RSS Feeds then it could be bad for our blog because it will result in the name of duplicate content. 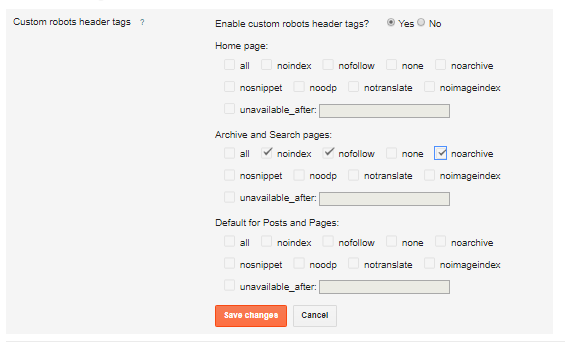 Well, to overcome this problem, we can optimize the settings of the RSS Feed in blogger. In the "Allow Blog Blogs" section select "Short"
If my friend chose this option would be less good for our blog readers who subscribe using RSS because every time we update the reader would not want to have to open our blog to read the whole article that we publish. But what else. this is done to prevent duplicate content due to content thieves. 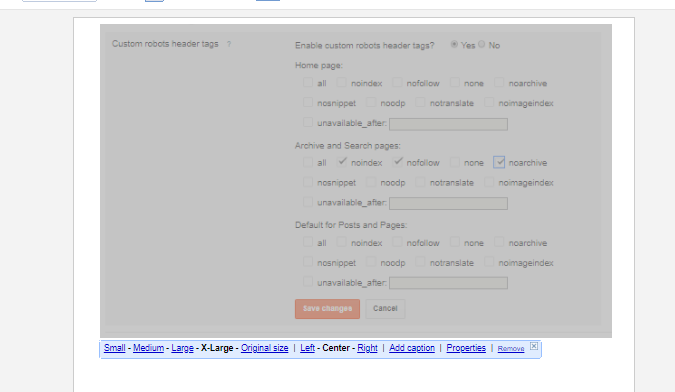 One of the cool features in blogger is the Meta Tag feature. 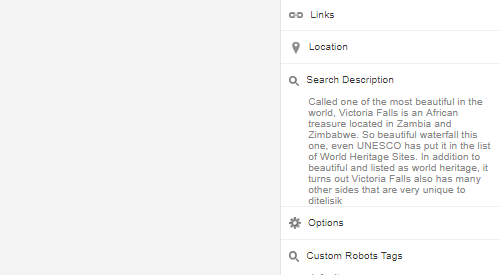 This feature allows us to enter the blog description meta without having to manually enter it into the template. This feature is actually already in blogger since the beginning of 2012 ago, but probably still many do not know or have not used it. To enable this feature is easy, just go to Dashboard> Settings> Search preferences. Then focus on the Meta tag section and click "Edit". After that comes the question "Enable search description?" Select Yes. Last stay friend inputs your blog description. Do not forget to click "Save changes"
This feature serves to direct the link to our blog but the link does not really exist alias page 404. I myself do not use this feature, but in certain situations, this feature can be very useful. Well at such times this special redirection feature becomes useful. We can redirect the wrong link to the correct URL. So the backlinks that we already put in social bookmarking, for example, to be not in vain. Do not forget to tick "Permanent" so that the wrong link is transferred permanently. If it already clicks Save first and clicks Save changes. For the robots.txt feature I have already mentioned in the post how to handle duplicate content, but I will rewrite to complete and good. Robots.txt is that sob? robots.txt is a text file (.txt) inside a web page that contains which commands are indexed pages and which index spiders should not index. 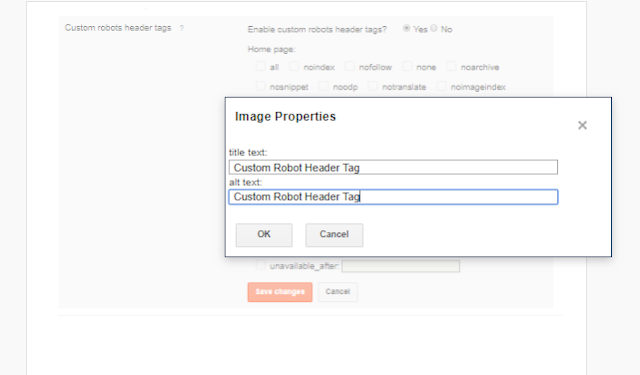 As I have already explained in my first post, this robots.txt we can optimize even better to prevent duplicate content. The robots.txt code above contains commands to prevent search engine spiders from indexing mobile versions of pages that are in the default state of the mobile version of the page are often indexed by search engines and cause duplicate content. The robots meta tag is essentially the same function as robots.txt, which is to tell which page crawler robots are indexed and which pages should not be. There are also several other commands. 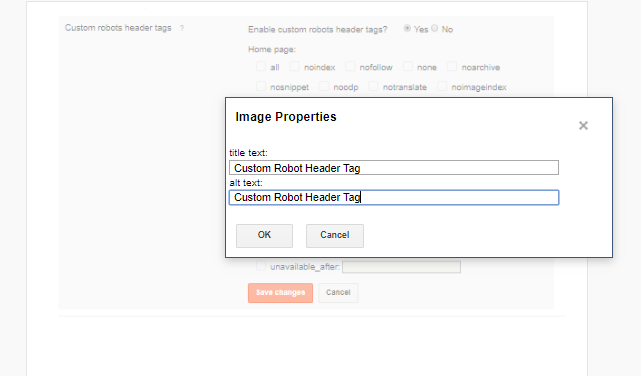 If you create a post with an image then you are strongly recommended to use the cool feature in this blogger, which is the feature to automatically add "alt" and "title" attributes to the images in the post. In the past before this feature, a lot of bloggers who use an automatic description meta tag code for posting and until now there are still many who use it. Well because in blogger there is a feature to enter the post description meta manually, it will be very cool if my friend uses this feature so that every post on your blog has a varied meta description. If more than 6 words, then permalink will be automatically truncated and display only 6 initial words of the post title. Well, if my friend wants more than 6 words then my friend can use this feature. 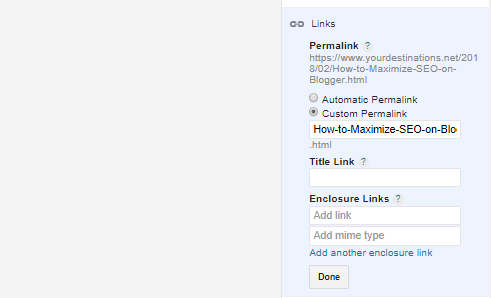 The trick, when my friend wrote a post click on the Permanent Link menu on the right and select Custom Permanent Link, then stay permalink buddy as long as you want. The last one to maximize SEO blogger is a template. The selection of a good template can also help maximize SEO on your blog. There are so many good free blogger template providers out there, but very few are practically SEO Friendly. Good template criteria for SEO is like sob? hmm .. since this post is quite long, almost 4hours more I write this post, so for template problems Insha Allah I will discuss in the next post. Maybe it's just that much I can write this time. less then please can add my friend.